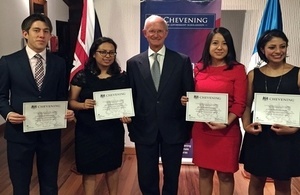 This year four Guatemalan students were awarded a Chevening Scholarship, which is globally recognized as the UK government’s official programme that seeks to enrol exceptional individuals and support the next generation of leaders. The candidates went through a rigorous selection process and were awarded scholarships to study a Masters degree for a year in the United Kingdom. All of them will receive full scholarships that include travel costs, a monthly stipend, and academic fees. Chevening Scholarships are funded by the Foreign and Commonwealth Office and partner organisations. Chevening Scholars come from 118 countries worldwide, including Guatemala. I would like to congratulate the four winners on their scholarships. Chevening offers a unique opportunity for future leaders, influencers, and decision-makers from all over the world to develop professionally and academically, network extensively, experience UK culture, and build lasting positive relationships with the UK. Upon their return, I’m sure they’ll make outstanding contributions to the future development of Guatemala. I wish them the very best of luck. The process for applying for Chevening Scholarships for the academic year 2017/2018 is now open for Guatemala until 8th November 2016. Please visit this web page to get all the details: http://www.chevening.org/guatemala.